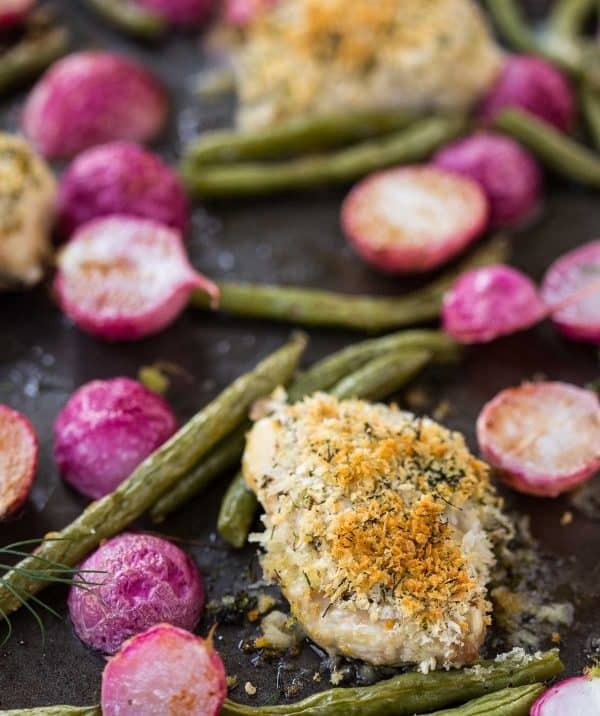 Crispy chicken thighs baked with Dijon and dill are great on their own, but with the addition of roasted green beans and radishes, you have a perfect springtime sheet pan dinner. It’s no secret that I’m obsessed with my sheet pans. Roasted vegetables basically make my world go ’round. Roasted broccoli is the only way to eat broccoli, roasted carrots are sweet and flavorful, mushrooms gain depth and texture, squash shines, and the list goes on and on! When my apple Gouda stuffed chicken sheet pan dinner turned out to be wildly popular right out of the gate, it became clear that more sheet pan dinners were necessary. I’m excited to be teaming up with Just BARE® chicken again this year to bring you this recipe and another later on in the year. 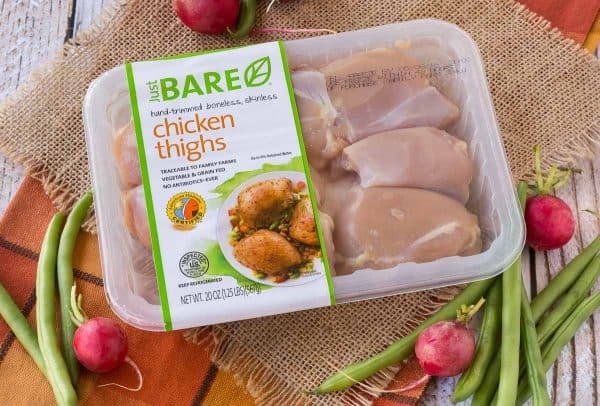 Just BARE chicken has been a partner with Rachel Cooks for a few years now and it’s because I love the brand’s chicken. Its chicken is raised without antibiotics, vegetable and grain fed, hand-trimmed, and traceable to the family farm it came from — pretty great, right? This chicken is a springtime win. 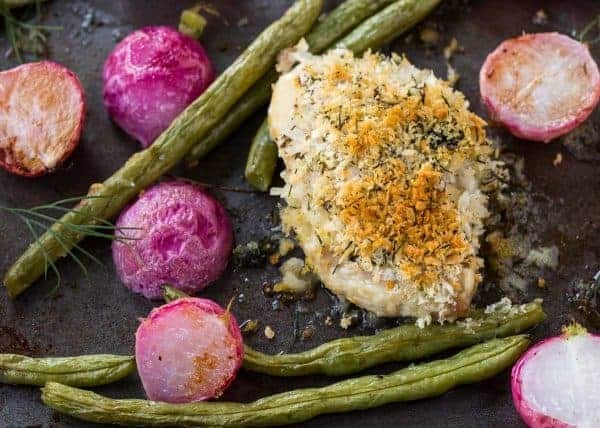 Radishes transform into sweet and tangy nuggets when roasted, roasted green beans are irresistible, and the crispy panko coating on the juicy chicken is what will keep you coming back for more. The beauty of sheet pan dinners like this one is that you only make ONE PAN dirty. Well, two in this case. You could probably get by with one if you reallllllly hate dishes, but the trick to roasting vegetables is to give them lots of room to breath so they get brown and crispy and not soggy and steamed. This dinner would be great on its own as a light meal, or you could bulk it up with a tossed salad. Sometimes I make some brown rice for Ben with dinners like this, or I’ll bake a sweet potato to go with it. Divide vegetables onto two sheet pans. Toss with 2 tablespoons olive oil (one tablespoon for each baking sheet). Sprinkle with salt and pepper. Arrange chicken on sheet pans amongst the vegetables. Rub with Dijon mustard. In a small bowl, mix together panko, 1 teaspoon olive oil, salt, pepper, and 1 tablespoon fresh dill. Divide evenly on top of chicken, pressing down to adhere crumbs to chicken. Sprinkle remaining dill over vegetables. Place in preheated oven and bake for 15 minutes. Carefully stir the vegetables without disturbing the chicken. Cook for 10 more minutes or until chicken is cooked through and internal temperature measures 165° F with an instant read thermometer. 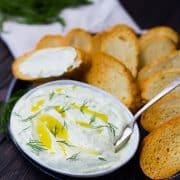 Garnish with additional fresh dill and serve immediately. Verdict: I love these crispy chicken thighs and roasted vegetables! 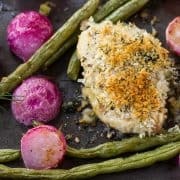 The flavors of the dill and Dijon are so great not only with the chicken, but also with the vegetables. It’s the perfect springtime meal. Husband’s take: He couldn’t get enough of this chicken either. Difficulty: Easy! And with only two sheet pans dirty — WIN. You can also find more chicken inspiration on Just BARE’s Facebook, Twitter and Pinterest pages. I just made a sheet pan dinner the other night- chicken is perfect for sheet pan dinners. This looks delicious! I love sheet pan dinners – seriously, is there anything easier? I also love radishes, but I have never roasted them, but now that’s about to change. Nothing better than sheet pan dinners! 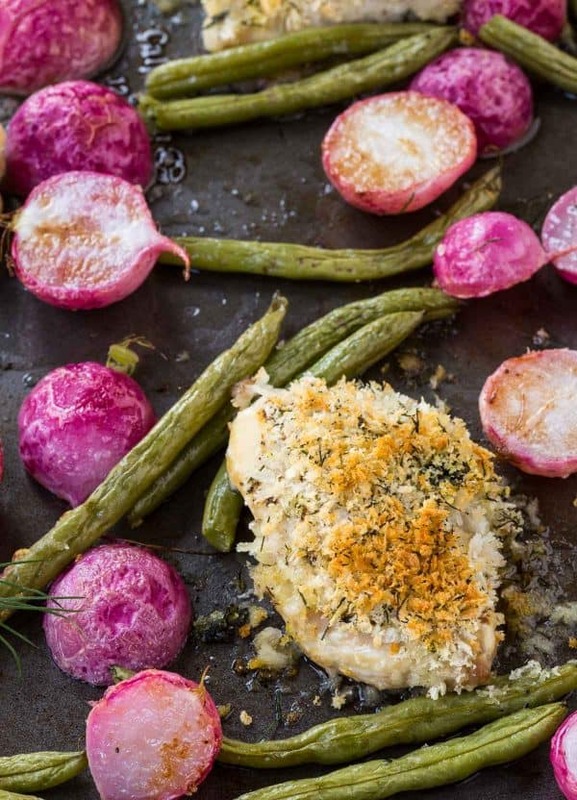 I hope you love roasted radishes – it’s my favorite way to eat them. Thanks Gina! I agree – it’s the best way to eat radishes! I adore sheet pan dinners, and we have been eating chicken thighs like crazy lately. Love this!! Thanks Deborah! Thighs are so good and so low maintenance. Oh, Rachel, I’d love to make this for Sunday Supper. Looks so good … and easy! I hope you try it and love it, Sandy! 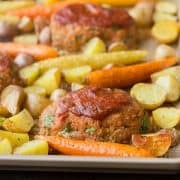 I’m obsessed with sheet pans too…meals like this make the world go ’round much easier (at least for me ;) ) What a tasty looking meal! I have to look for that chicken, I don’t think it’s at my grocery store, but maybe I’ve seen it at Target? This is my kind of weeknight meal! I love when everything cooks on one pan and that dijon dill sauce sounds incredible. Thanks Ashley! The fresh dill is a must! I love how easy this is…and it looks SO good!! What a perfect summertime dinner! 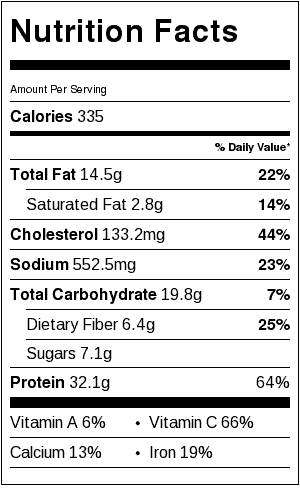 I’m totally going to track down that chicken next time I go grocery shopping. Love these flavors together and one pan makes them even better! I’m a huge fan of sheet pan suppers! Your chicken looks phenomenal and I never pass up a reason to cook beets! Thanks Liz! They’re actually radishes, not beets — have you tried roasting radishes? They’re so good! Thighs have always been my favorite! I need to look out for this brand in the store. Thanks for the heads up and this delicious recipe. 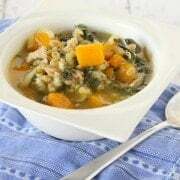 So easy and healthy, love this! I love all in one meals like this! Also I do not use dill OR radishes enough. Time to change that!